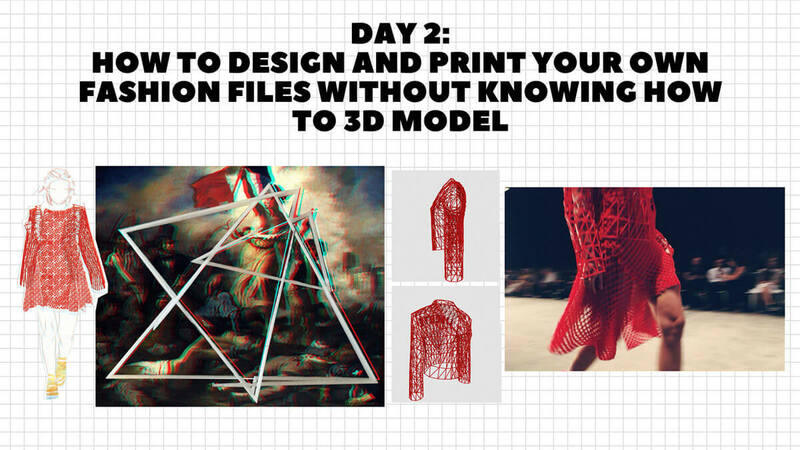 Join me on the front-lines of fashion history and learn how to 3D print fashion – all by yourself! We are proud to introduce and invite you to learn from 3D printing expert Danit Peleg in an eight hour, live workshop that will give you the knowledge and insights from Danit’s past three years of research and experience with 3D printing fashion – all in just three days! Over the course of the three, intimate live sessions with our 3DP fashion designer, you will gain comprehensive knowledge of fashion-tech history, as well as the precise tools and skill set required to begin your own 3D printing journey. Absolutely no previous experience required! Join for our first session for a special price of $540 for the three-day course. We will be happily accepting date suggestions for our second run of the course, so please reach out with your input! *This course is limited to 20 participants and spots are available on a first-come basis, so move quick! What if I can’t join the course coming up? When is the next course date? We currently do not have a specific date for the next course but believe it will be in the beginning of 2019. We will be happily accepting date suggestions for our third run of the course, so please reach out with your input! What do I need to know/experience prior to the workshop? This is a beginners course with absolutely no prior experience required – just an interest in fashion tech and a passion to learn. Click here to purchase tickets and reserve your place. Space is limited – we only have 15 spots available for our first course, so move quick! Will we be doing any 3D modeling? While this will not be a main focus of the course, I will introduce 3D modeling through several different softwares listed below. This is the first step in the process of 3D printing fashion, so you will learn how to 3D print swatches of textiles without having any background in 3D modeling. Which softwares will we be using and will I need to purchase a license? All softwares we will be using (aside from optional Photoshop + Illustrator), are open-source and do not require a license to be purchased. I understand students receive a Danit Peleg pattern for garments at the end of the course - will I need a sewing machine or any other equipment? One of the exciting aspects about 3D printing for fashion is that you don’t need a sewing machine! In order to assemble this garment, you will, however, need access to a 3D printer, a spool of filament as well as the specialized glue which I use. If I have questions after the course will I be able to get in touch? This workshop will take place in real-time, with questions coming in on the go but of course, if you have more questions after the course you are welcome to email me and I would love to answer them!